The pewter filigree scrolls lend an edge to the fashion, perfect for brave and beautiful souls. How lovely the single passion flower bloom set with a turquoise cabochon stone and resting on a bed of high relief, ornate filigree vines and leafy scrolls. 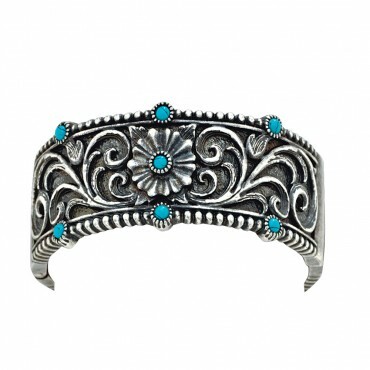 Turquoise cabochon stones dot the edge on each side a distinctly Southwestern edge.